DC Entertainment's popular animated films will continue with several new films announced at Comic-Con. First up will be an animated adaption Batman: Gotham By Gaslight, the popular 1989 graphic novel that introduced a Victorian era Dark Knight in pursuit of Jack The Ripper. Following that film in the Spring of 2018 will be Suicide Squad: Hell To Pay. This will be the first Suicide Squad film that takes place inside the shared continuity that some of the DC Universe animated films have. 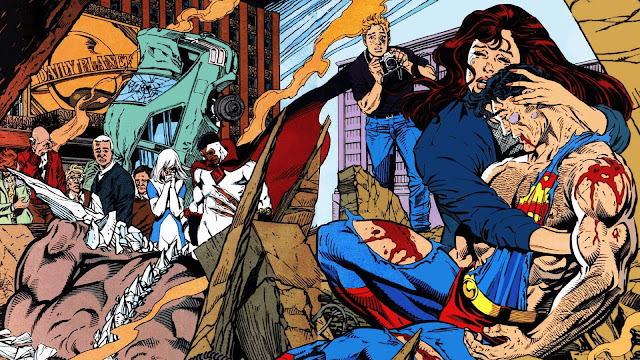 To finish of 2018 will be a two part release featuring the Death Of Superman in an animated version more true to the comic book story than 2007's Superman: Doomsday, which happened to be the very first DC Animated film. This will be followed by Reign Of The Supermen which tells the story of the alternate Supermen who tried to replace Clark while he was gone including Steel, Cyborg Superman, Superboy, and the Last Son Of Krypton. These titles will be out in late 2017 and into 2018 on digital, DVD, and Blu-Ray. The next DC Animated film is Batman & Harley Quinn and is due in stores in August.